Whooping cranes are a distintive sight in flight with their white color, black wing tips, long necks and trailing tall legs. Two white adult whooping cranes, with a juvenile in the center, searching for food in a grassland area. They enjoy corn kernels and invertebrates. But these distinctive, swan-necked birds nearly went extinct. Now, breeding programs are helping them make a come back. Unlike their cousins sandhill cranes, which are plentiful in the Midwest, whooping cranes were always somewhat rare. They once numbered about 600 in the world, but by the 1950s, that number had declined to about 20. Slowly, they have begun multiplying. There are once again an estimated 600 cranes across the globe—about 450 in the wild. 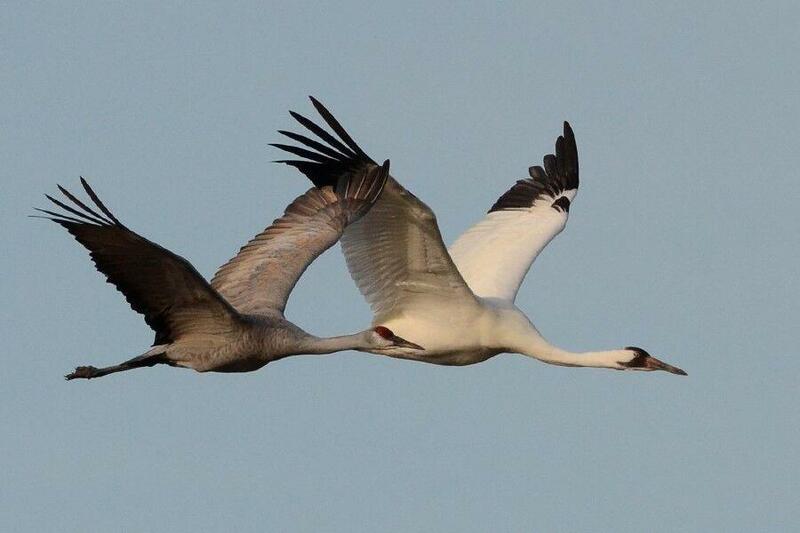 There are an estimated 100 cranes in the Midwest. 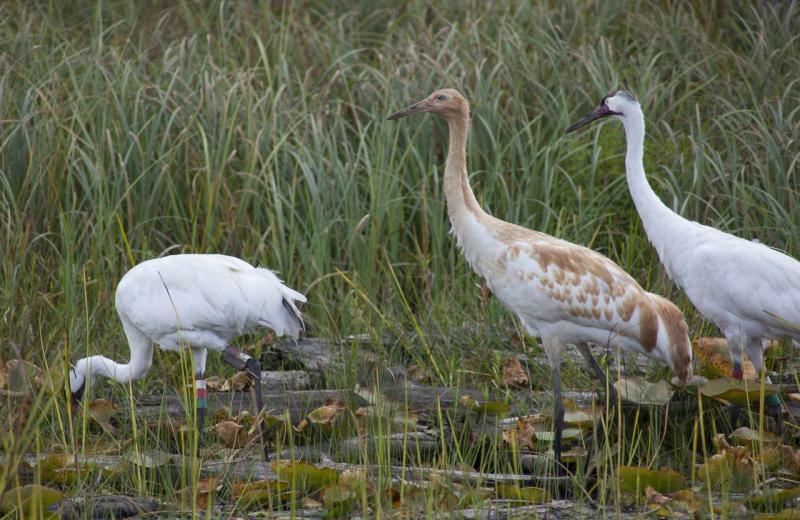 “They are known as the miracle birds,” Elisabeth Condon, whooping crane outreach coordinator for the International Crane Foundation in Baraboo, Wisconsin, said on GLT’s Sound Ideas. Condon will speak about efforts to conserve the whooping crane Thursday at 7 p.m. at the Center for Natural Sciences on the Illinois Wesleyan University campus. This is the time of year—early November through December—when whooping cranes begin their trek south from Wisconsin, passing through Illinois then Indiana, a preferred stopping point, and on to points southeast. Elizabeth Condon of the International Crane Foundatin will speak about the remarkable recovering of whooping cranes, which nearly became extinct 60 years ago. Though a favorite of bird watchers, Condon warns that whooping cranes are still a rare sight. Sharp-eyed bird watchers might spot one or two among a flock of the more plentiful sandhill cranes. Whooping cranes are easy to identify. The adults are white, stand about five fee tall (sandhill cranes are brownish-gray and shorter), have a patch of red on their heads and black wing tips. They also have a sharp, high pitched call. Sandhill cranes and whooping cranes like to putter about cornfields that have been harvested, Condon said. “They will walk around the soil, poke through with their beaks. They really like to eat the corn that has been left over from the harvester, and then they will eat whatever invertebrates they find,” Condon said. If there happens to be a wetland area near a cornfield, “That’s a really ideal place to find cranes” she added. Cranes are an exceptional sight in flight. Their long necks extend before them, and their tall legs trail behind them when they fly. Humans are helping to ensure the whooping crane’s survival, but it was humans who nearly wiped them out a half-century ago, Condon said, by eliminating their natural habitat. “Whooping cranes are dependent on wetlands. When Europeans were colonizing the United States, they didn’t see the value in wetlands, and a lot of them were drained for agriculture,” Condon said. Another reason for the birds’ demise: unregulated hunting. “Prior to the beginning of the 1900s, when we started to put regulations in place, it was open season on most animals," she added. Whooping cranes were hunted for commercial trade in feathers, for museum collections, for sustenance and as hunting "trophies." She said many hunters today are involved in efforts to restore wetlands and give the birds back their sanctuaries. "I think most Americans in general are just really inspired by the story of the whooping crane," she said. Whooping cranes aren’t particularly friendly, however. If they begin flashing the red patch on their heads, “You should read it as a stop sign and stay away,” Condon noted. Cranes are "most safely enjoyed from a distance," with binoculars, she warned. “If you approach them or cause them to fly away, or cause them to change their behavior in any way, we consider that a no-no," Condon said. Cranes are aggressive and territorial birds. They sometimes appear to be dancing, but it is the method they use to mark their their territory. "That’s not an opportunity for you to dance back because you are actually communicating to them that you are being territorial too," Condon said. "And you might be getting into a territorial dispute with a bird that is five feet tall and has sharp claws." Like humans, they walk on two legs and form bonds for life. They raise one or two chicks at a time and shower their chicks with parental attention. “They are pretty long-lived and pretty intelligent birds” Condon added. Cranes are particularly common in Japanese poetry, folk tales, painting and crafts. Condon said there are 15 cranes species in the world, and Asia has highest number of crane species of any region. 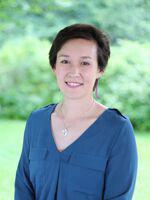 “Lucky for us, most Asian cultures really embrace cranes,” she added. Condon’s talk will take place in Room C101 of the Natural Sciences Center at Illinois Wesleyan. The event is co-sponsored by the John Wesley Powell Audubon Society, the environmental studies department, and the Beach Lewis Fund of the biology department.